This high quality auger bit may become one of your most used drill bits. 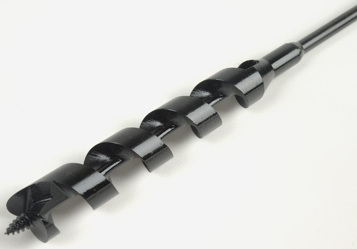 Fabricated by Freeform using advanced manufacturing techniques, this bit includes an integral lead screw with course threads for precise drilling. The lead screw minimizes bit drift or “walk” and will help “pull” the bit through wood, taking less effort by the installer. The bit is made of a fully heat treated, high quality carbon steel for strength and is formed having wide flutes to carry drill debris and chippings away from the bit head to reduce clogging. The shaft length is 18" with a standard 1/4" diameter shank so it can be used with our 1/4" shank EXT™ Series flexible drill bit extensions (page 24) to increase your effective bit length in 2ft., 4ft. or 6ft. increments. Premium Freeform Auger Bit 3/4"x18"